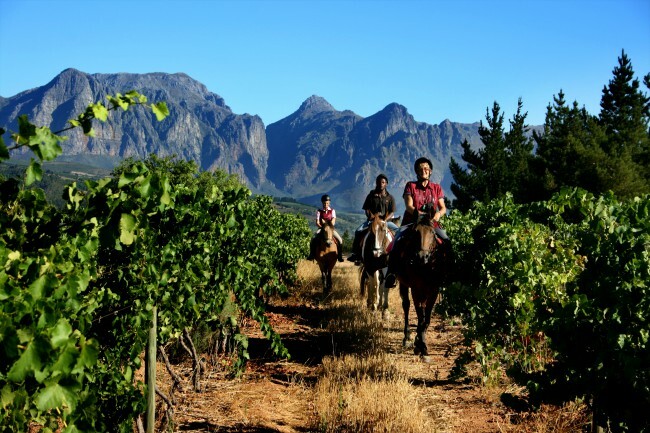 Starting from the stables on the renowned Diemersfontein Wine and Country Estate, these one-hour to half- or full-day trails wind their way through vineyards, olive groves, herb fields and natural fynbos into the foothills of the Hawequa Mountains, from where riders have beautiful views into the valleys below. Wine tasting trails to prestigious boutique cellars on historic farms are also on offer. Afterwards clients can enjoy a meal at the Seasons Restaurant on the estate where accommodation is also available. Novices should not attempt rides longer than one and a half hours, whereas riding fitness is required for long trails. The weight restriction is 100 kg.